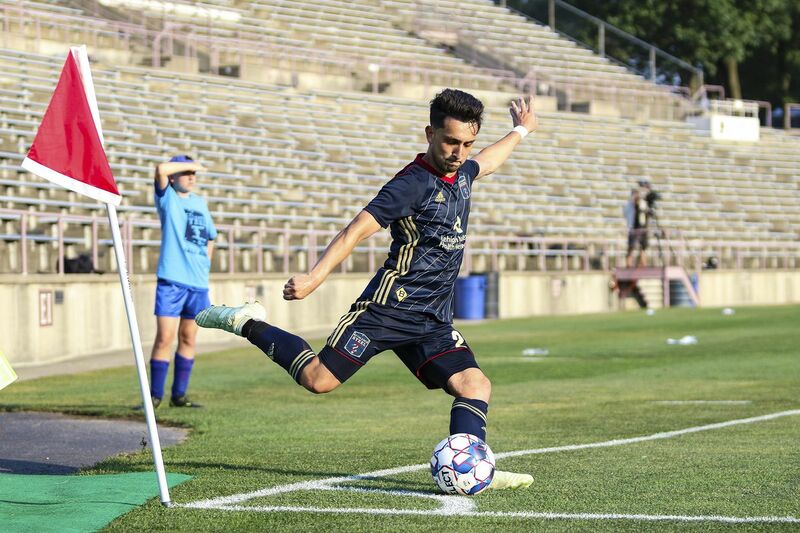 Philadelphia Union midfielder Adam Najem in action for Bethlehem Steel, the team's minor-league USL affiliate. A first national-team cap is a rite of passage for every elite soccer player. For Union midfielder Adam Najem, the honor went well beyond the game. This past Sunday, Najem made his debut for Afghanistan, the home nation of his father Ahmed. Afghanistan played to a 0-0 tie with Palestine in Kabul. It was the nation's first true home game in five years. "We arrived at the stadium about 2 1/2 hours before the game, and there were already six, seven thousand people there," he said. "As soon as we stepped out, even before warmups, everybody was cheering and whistling. We took laps around the field and it was incredible – it gave me the chills. That's something I'll never forget." It's impossible to separate life on the field from life off it in a war-torn country like Afghanistan. The 23-year-old Najem was well aware of what the game meant for the nation's people. "Any sense of joy and happiness that we could bring to them, it was really amazing, and it meant a lot," he said. "If we can continue bringing that sense to the fans and the people of the country, it will only continue to get better." Adam's older brother David, of the USL's Tampa Bay Rowdies, was also on the Afghan squad, though he did not play. During the trip, they met with an uncle who still lives there. You might think there would be political ramifications for Americans playing soccer under Afghanistan's flag. Najem said when he was with the team, there was none. "A lot of those guys come from different countries like Sweden, Germany, Norway, Holland — everyone has been around the world," he said. "There were definitely questions about America and the [soccer] league, but no one looked at me differently because I was from the United States. Everyone really helped me out." Nor were there any major security issues. "Everyone knew that anything could happen at any moment, but that's life, you know?" he said. "I'm glad I took the risk of seeing the country and being part of that. We stayed in a great hotel with a lot of security." Upon returning to Philadelphia, Najem returned to pursuing his first playing time for the Union this year. With Borek Dockal atop the playmaker depth chart and Anthony Fontana set as his backup, Najem has only featured for Bethlehem Steel. He has two goals and two assists in 14 games this year. "I come back more mature, come back more confident," he said. "I love this game too much to sit back and just take not doing anything."